BarbsfMin. with length to coil maximum 400 meters and weight per bundle 40/50 Kg. supplied only under special demand. flow of formed wire. All the adjustable parts are altogether accessible and machine standards. hobbing. The machine is l200 kg. in weight (App.) exclusive of pay-off stands. Floor Space : 8 x 5"
Production Capacity 500 to 600 kg. Appx. We offer you complete range of Wire Nails. Wire Drawing Continues Plants. Draw Bench. Expended Metals Wire Mesh. Automatic Wire Galvanized Nut & Bolt Plants Approved By NSIC, SSI. RCF Specifications are Subbject to change without notice. 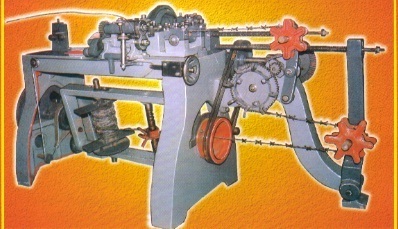 Sokhi Machine Tools incorporated in the year 1978, at Bengaluru Karnataka, are recognized as one of the leading retailers, wholesalers, traders and suppliers of a varied variety of Lathe Machines, Milling Machines, Surface Grinding Machines, Metal Cutting Band Saws, Metal Cutting Band Saws, Power Hacksaw Machines, Welding Machines, Power Press Machines, Shearing & Press Break Machines, Slotting & Shaper Machines, Plano Miller Machines, Drilling Machines, Independent and Self Centering Chucks, Cut Off Machines, Bar Straightening & Polishing Machines, Nut Bolt Machines, Wood Working Machines, Machine Spares and Electrical Products. These products are procured from licensed and trustworthy vendors of the industry, who manufacture the entire assortment in compliance with defined industry standards. The offered range is fabricated using premium grade raw material and advanced technology by our reliable vendors at their hi-tech manufacturing unit. Our machines are extensively appreciated by the clients for their sturdy construction, precision engineering, reliable performance, optimum output, low maintenance and longer service life.